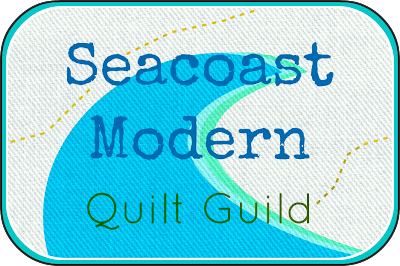 The next meeting of the Seacoast Modern Quilt Guild will be January 5th from 10:00-12:00 at the West Newbury Town Annex at 381 Main Street, West Newbury, MA. 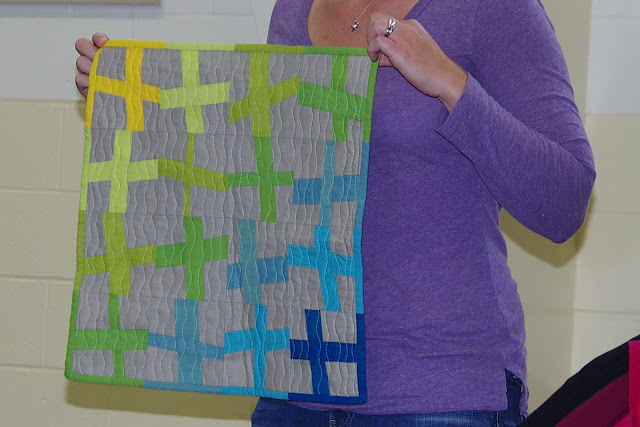 The topic will be paper piecing, taught by Amy Friend. I (Amy) was struggling to think of a block design for this meeting. 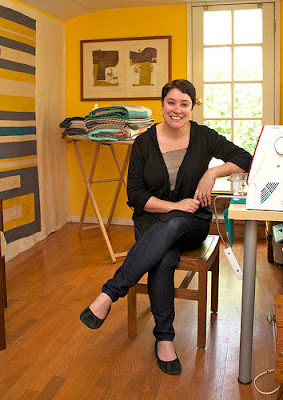 I settled on a sewing machine because I figured that everyone in a quilt guild should appreciate that subject! 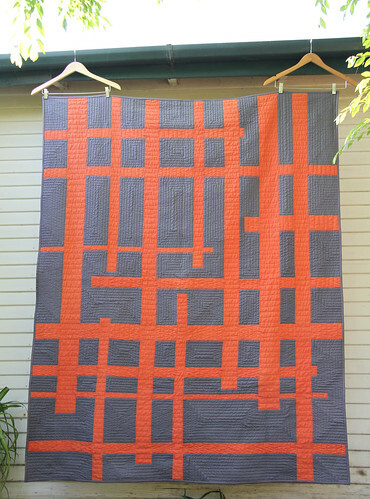 I designed a block that is simple enough for the beginner with no curves or Y seams. 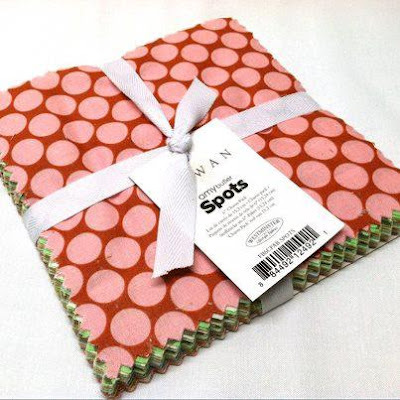 There are only 4 spots where seams need to meet. 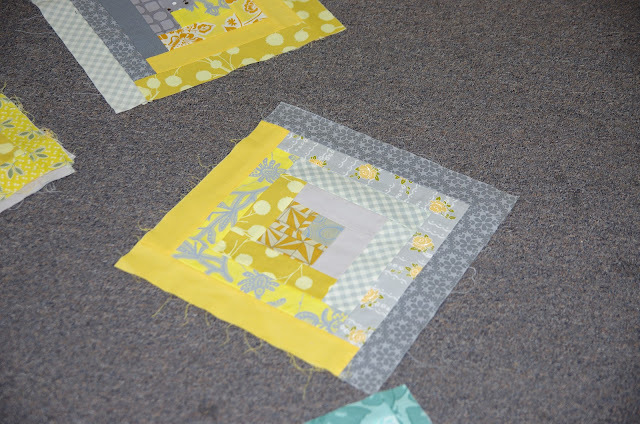 But there is also enough detail to make the block interesting and to provide "teachable moments." 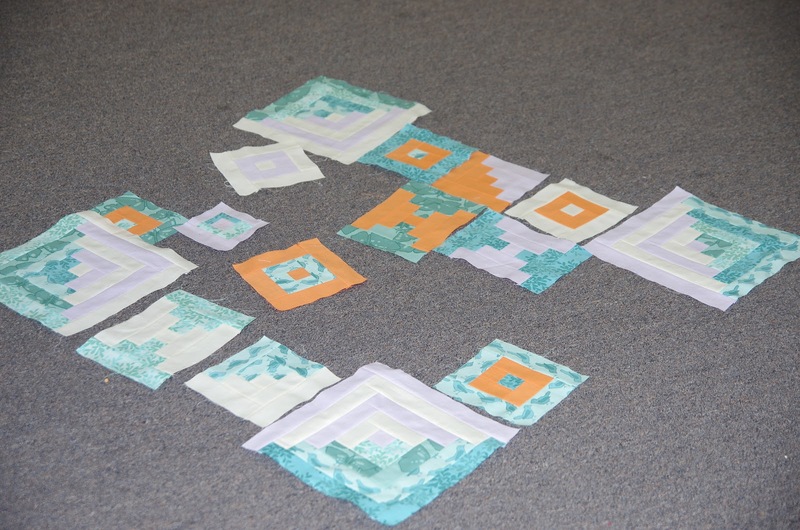 I will send everyone in the guild the pattern. Please print it out and bring it to the meeting with you, along with your sewing machine, a size 90 needle, thread and your fabric selections. 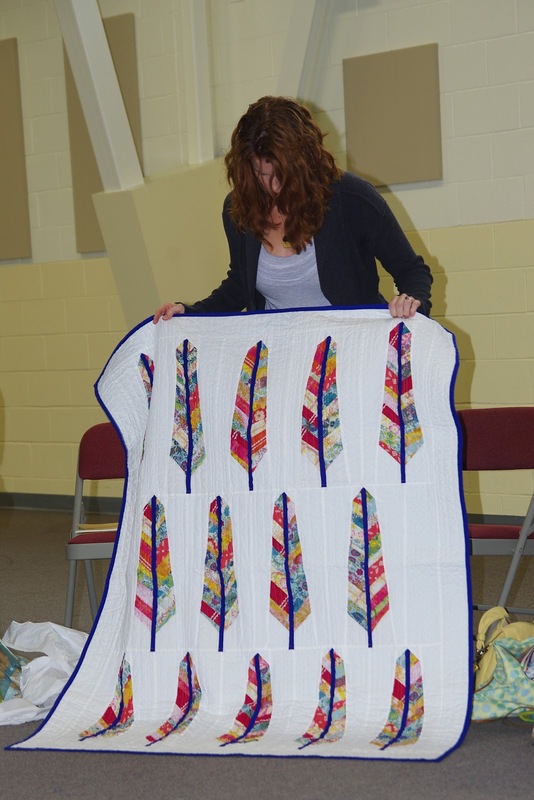 You should also bring a couple of pins, a seam ripper and scissors. 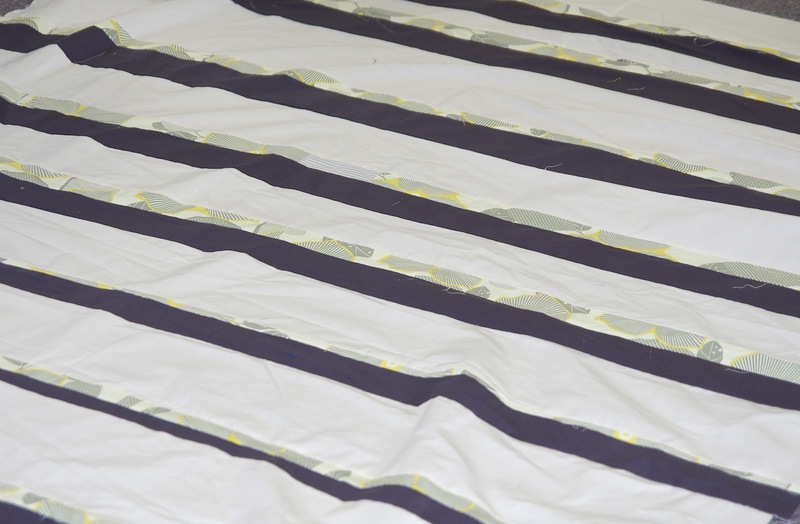 It would be helpful to have multiple cutting mats, rotary cutters, irons and ironning boards. If anyone is willing to bring theirs, it would be appreciated. When you are selecting fabrics, look for prints that might have the name of a sewing machine that you could fussy cut. 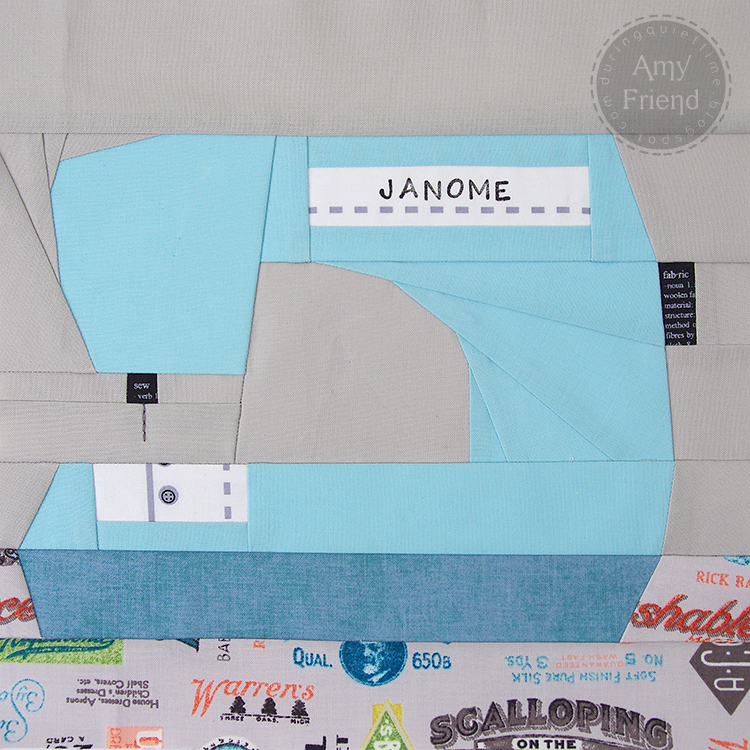 I didn't have anything like that so I used stamps and printed "Janome" becuase that's what I own. We will have refreshments at this meeting, coordinated by Robin Lent. Also, bring your show and tell as usual! We had a nice time at the sew in meeting held Dec. 1st. Thank you to everyone who came out and braved the first bit of weather this winter! We distributed the fabric for the Madrona Road Challenge at the meeting. Michael Miller provided enough for each of our 12 participants to receive a fat eighth of 6 prints and one coordinating solid. 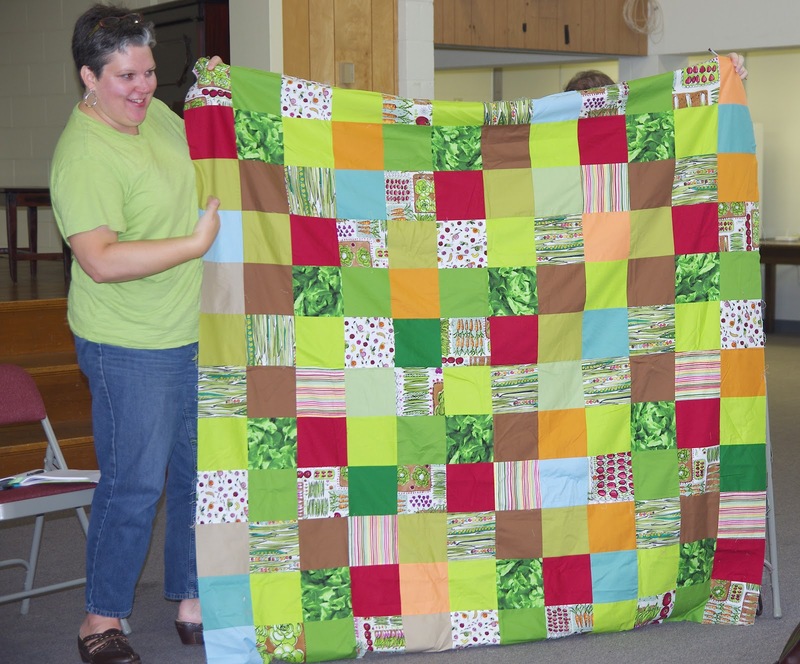 Peg from Sew Fresh Fabrics provided a fat eighth of the farm and pick up truck print on the top of the stack to round out the collection. Thank you Peg! For this challenge, we decided to limit ourselves to pillow covers. You may make a pillow cover of any size or shape using this collection. 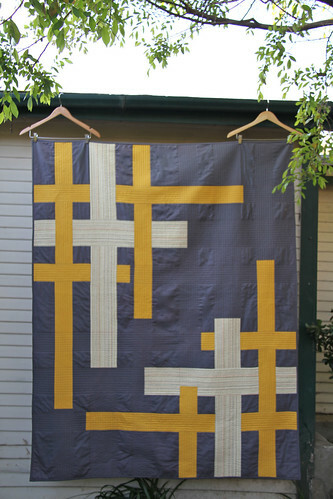 If you want to add more fabric, you may only use solids or other prints from the Madrona Road collection. 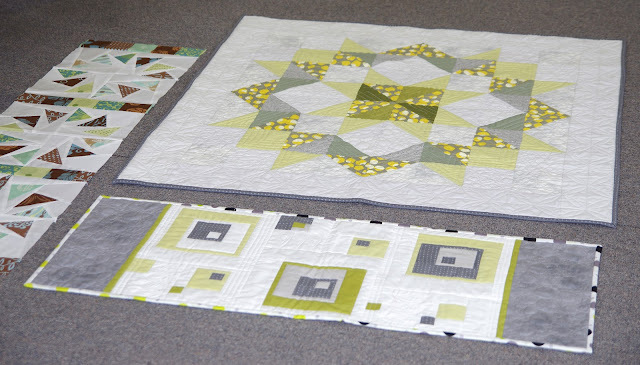 Both Peg and Becca have these prints available in their shops if you would like to support your fellow guild members. The challenge ends January 31st. If you have a blog or Flickr account, please go ahead and share pictures of your project at that time. We will share the projects at our February 2nd meeting and will take pictures at that time to share for those who do not have blogs. 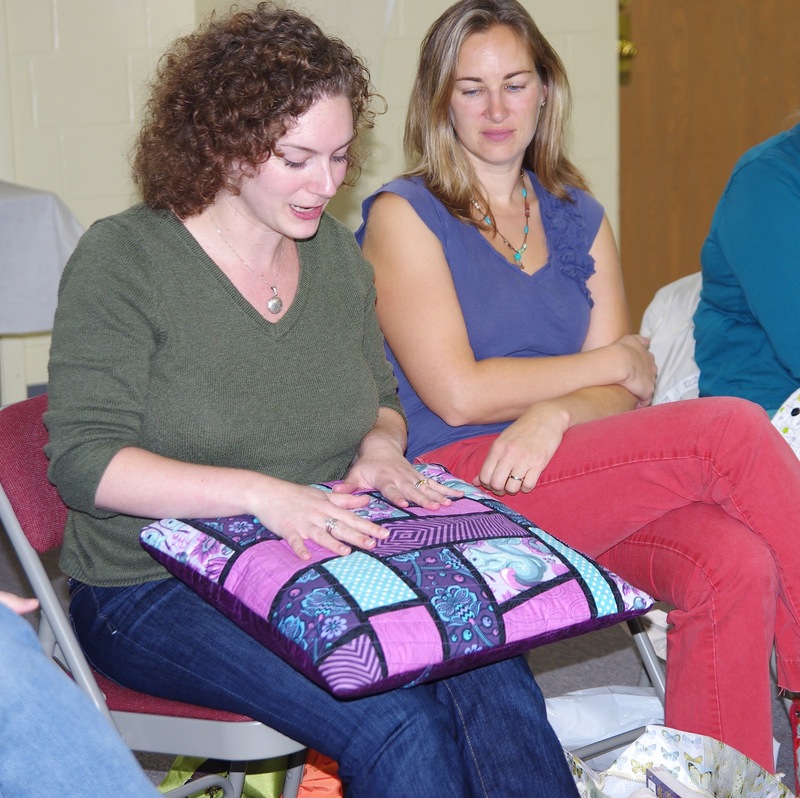 We will vote on our favorite pillow at the meeting in February and award a prize! This is a reminder that we will be meeting this Saturday, December 1 from 9-1 at the West Newbury Town Building Annex, where we have previously met. This meeting will be a sew in so please bring your machines, extension cords, power strips, fabric, notions and anything else you need to sew. We will provide two ironing boards and irons and two cutting mats, as well as tables and chairs. I don't think we planned anything as far as refreshments are concerned for this meeting. If you would like, you could bring something to share or pack a lunch since it will be a long meeting. Please remember to have your handmade name tag ready, bring a show and tell, and bring your ugliest fat quarter to swap. Our December meeting will be held on Sat. Dec. 1 from 9-1 at the West Newbury Town Building Annex, where we have previously met. 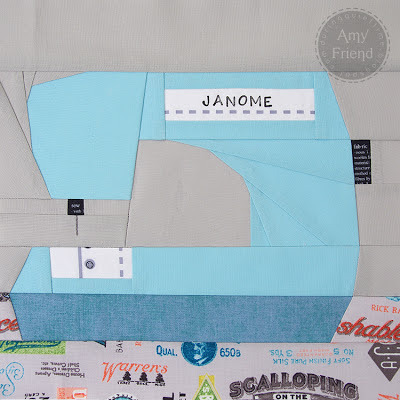 I extended the time at the request of a couple of the members so that you can get more done at the sew in after having lugged your machines in and set them up. Please remember to make your handmade name tag for that meeting and bring an ugly fat quarter if you want to participate in that swap. We were lucky enough to have the opportunity to hear Alissa Haight Carlton speak this afternoon at our SMQG meeting. 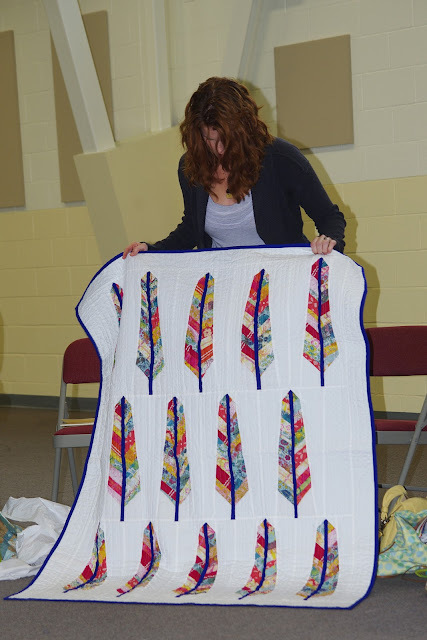 She shared images of many of her quilts and also managed to carry six or so in her luggage to show us! We were joined by the BMQG for this meeting which was the first of many joint ventures, I hope. 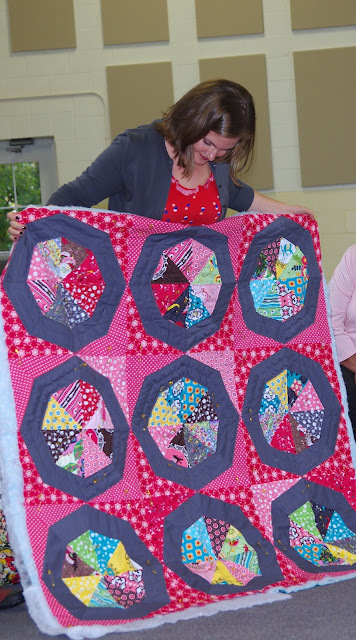 Alissa spoke about her personal quilting progression from wonky log cabins through her current work, her two books, and the establishment of the MQG. Her little baby boy was an angel through her whole talk (thanks in part, to her twin sister who was caring for him in the back of the hall). We had a little time for show and tell. Rebecca from the BMQG shared two of her beautiful quilts. 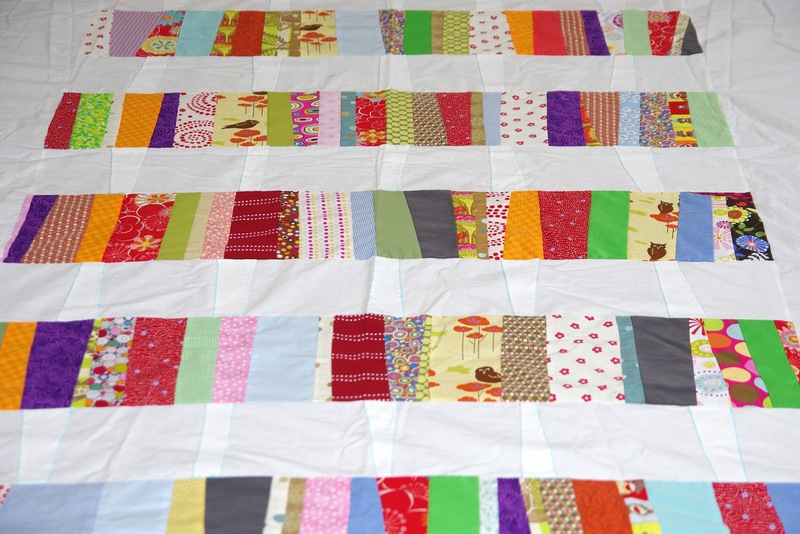 This quilt satisfies the fairy love of a little girl and the modern quilting aesthetic of her mom! Laura's spectrum quilt was made from a pattern in Elizabeth Hartman's new book. 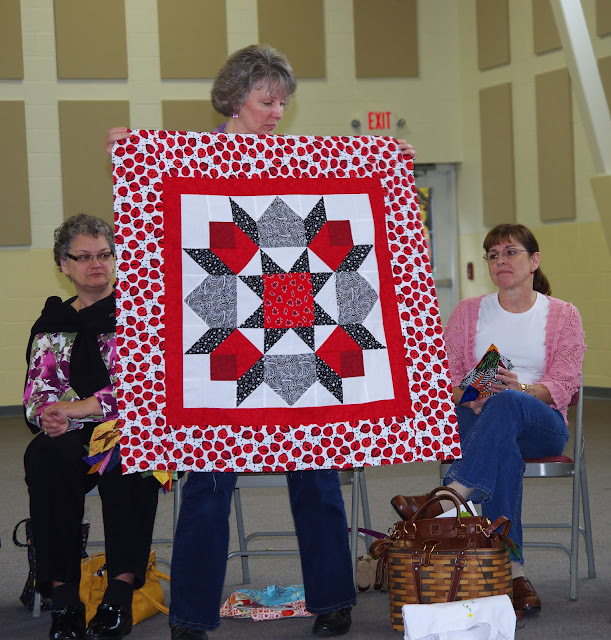 Nancy shared a paper pieced table runner. Stephanie made a fun pincushion for a swap. Here are the members of the BMQG who were in attendance, along with Alissa. My little munchkins sneaked into the picture. The next meeting will be Dec. 1, hopefully at the Annex (I will confirm that this week). 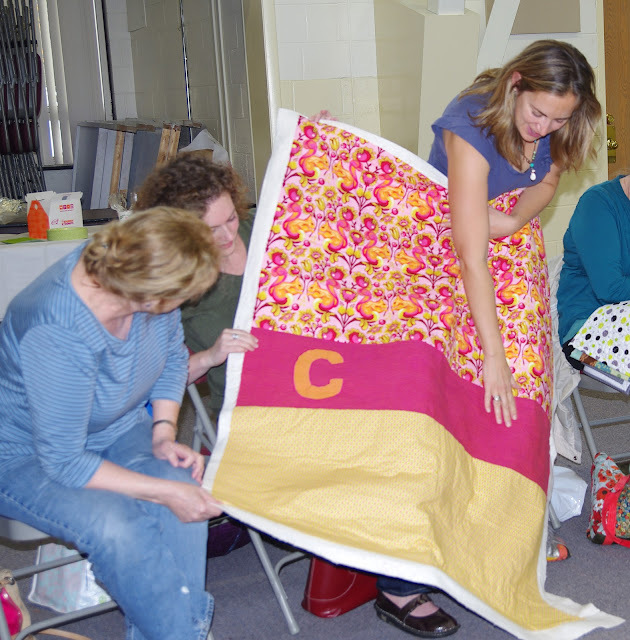 It will be a sew in-we plan to have a cutting station and an ironing station set up so you need to bring fewer items. Remember to bring one ugly fat quarter for swap and to make a creative nametag!